You don't have to be an athletically inclined individual to enjoy or participate in this event, it starts with a 5K but there are plenty of choices throughout the day. STICKER STOP, Raffles, Prizes, Vendors and MORE! Come join us for a day of fun! 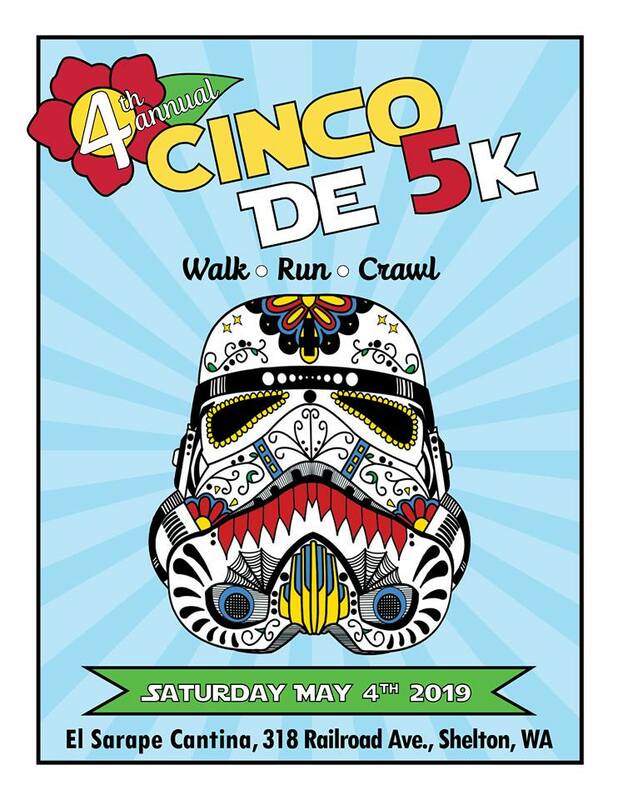 The 4th Annual Cinco De 5k & Event benefits Saint's Pantry in Mason County. You don't have to be an athletically inclined individual to enjoy or participate in this event, there is plenty of choices throughout the day. Come join us for a day of fun right in the heart of downtown Shelton! Check in begins at 7 am in the El Sarape Cantina parking lot (318 W Railroad Ave, Shelton, WA 98584) and the race starts at 9 am with many festivities to follow! Enjoy live music, vendors, A 96.9 KAYO STICKER STOP with tons of prizes, raffles, taco eating contest, beer garden and more! There will be a prize for the best dressed "Fiesta Wear" costume for both individuals and groups, giveaways and promotions all day! You don't want to miss this! *The beer garden is for 21+ and will be set up outdoor near the venders. Those browsing the vender booths and younger fans will be able to hear the music from outside the beer garden gate! To register for the 5K go here: active.com. Show your support for Saint's Pantry and stop on by! The event runs from 7:00am to 10:00pm on the following dates.